A jewel of a gift! 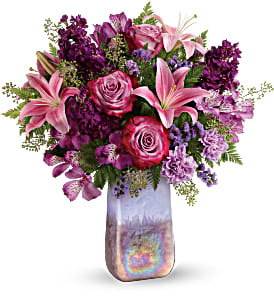 Bursting with a lush bouquet of lavender roses and pink lilies, this breathtaking, hand-blown art glass vase has a shimmering iridescent finish and soothing amethyst hue that's sure to make it a home décor favorite! 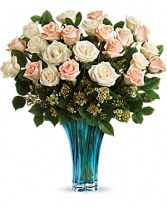 •This beautiful mix includes 12 peach roses, 12 white roses, white waxflower, and lemon leaf. 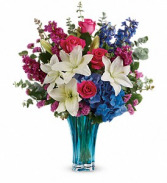 •Delivered in Teleflora's Heart's Pirouette vase. 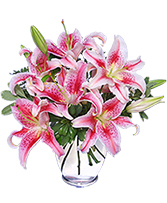 This vase of gorgeous Stargazer lilies from CAROLINA FLORAL DESIGN is beautifully fragrant and a special reminder that love is in the air!